Tonia Shulman should be a happy-go-lucky teenager, with very few cares. Instead, living in British-mandate Palestine with her Jewish family, she is forced to see things that a teenager shouldn’t see and to live her life on a kibbutz near Jerusalem which has very few amenities. Her father, Josef has a dream of helping to establish a Jewish state and the kibbutz they live on, Kfar Etzion, is the beginning of that dream. Tonia, however, has other dreams. She wants to go to the US and is determined to do so at any cost, even if that means leaving the love of her life, Amos, and the rest of her family behind. Will her dreams ever come to fruition, or will she remain with her family to become bitter and twisted? And will Amos ever forgive her for wanting to leave him? Although I know very little about this period in history, the author explains in a note that Kfar Etzion and the historical events described really did happen, although the Shulman family are completely fictional. That makes this book all the more powerful – it hits hard from the first page through to the last. Some of the atrocities that happen to the Shulman family and other Jews in the area are truly horrendous and although, of course, we are only reading about one side of the story, it is nevertheless chill-inducing. This makes it a very hard book to read at times. Thankfully, the love story between Tonia and Amos, that develops very slowly over the course of the book, lightens the atmosphere and gives the reader something to latch onto – wanting to know the outcome of their relationship is one of the main reasons to keep reading. It is not necessarily the highlight of the book – it certainly shouldn’t be considered to be a romance, because there is much more to it than that. Anyone concerned about foreign names and places that are hard to remember need not be. There is a certain amount of geography involved, particularly when the author is describing the attacks on Kfar Etzion, but it is not so intense that it is impossible to follow without a glossary. Names are not particularly difficult to remember either – Tonia’s family all have instantly recognisable names. It is also not necessary to have any knowledge about the period in history – it would no doubt help, but the author describes it in such a way that it is easily understood. Considering the story takes place over a number of years, this is no mean feat. The author’s writing style is excellent, it flows well and tells the story in such a way that it is immediately interesting. 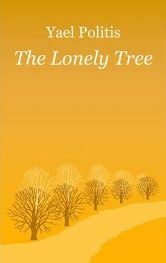 The book starts with the story of Tonia burying some family heirlooms underneath the tree of the book title, and although the story then skips backwards for a while, the tree does come back into the story at the end in a deeply moving way. Tonia is the main character; although the story is told in the third person, everything that happens is through her eyes, apart from the odd thread that follows her brother, sister and Amos. Tonia is an ideal heroine in that she is not content to sit back and see what life brings her. She really believes in forcing the issue and, although she loves her father dearly, she is quick to argue with him when she doesn’t agree. This doesn’t always make her particularly likeable, but it makes her very real. She does one terrible thing during the course of the story, which makes her seem very selfish, but, in the context of what is happening to her, she is simply fighting for survival. Her determination to accomplish something worthwhile in her life is commendable. Thankfully, the relationship with Amos, who is a Yemenite Jew, shows the softer side to Tonia – at least until she appears to betray him. He is an underground fighter, someone her father initially disapproves of because, although they are fighting for the same thing, Josef believes that there are proper ways to go about it. He shows a different side of life to Tonia and it is partially through his eyes that the distressing parts of the story are told. The author’s skill at rounding out each and every one of the characters, including the more minor ones, is really very impressive. This could easily have turned into a book about war and hate, but instead, it shows what life was really like for the characters involved. Each of them is incredibly realistic and has their strongpoints and flaws. At the end of the day though, they all come together to love and support each other – a poignant reminder of what happens to human beings under immense pressure. This is a book that many people will regard with trepidation, either because it is not always the most pleasant of stories, or because they are concerned that they know nothing about the historical events surrounding Kfar Etzion. That really shouldn’t be a concern. Although nastiness can’t be avoided, because it is part of the characters’ lives, it is ultimately a story about people and how they can cope when they need to – in ways that few people can understand. Coupled with the fact that Yael Politis is an excellent author who really knows how to make a story readable, this is a book that everyone should read at some point. I sincerely hope that the author continues to write, whether about this period in history, or something completely different. There is massive potential here. Highly recommended, five stars out of five. Published by Holland Park Press, it has 398 pages. Thanks to Holland Park Press for providing the review copy of the book. One Comment on "Home is Where the Heart is"
Well, I’m glad you liked it, because I found it tedious and couldn’t finish reading it. The language was terribly mundane and uninspiring for me. Moreover, I found the characters a bit too two dimensional for my taste, and with not enough individual voices. She tried to do the flashback and forward bit, it got far too bogged down in the past for too long, early in the book, and I think she should have straddled that a bit more, or just written it chronologically. My problem was I wanted to get back to Tonia’s present story and see how that played out, but she kept throwing me back to in all the stuff that led up to her being allowed to go to the school in Jerusalem. What didn’t bother me (and this was a pleasant surprise) was that it was about Kfar Etzion (which is in the West Bank) and therefore had a very right-wing bent, which is the opposite of my own political views. There were some factual errors as well, but let’s call that “literary license” and forget that. Still, I doubt I would have given it more than two stars – even had I been able to finish reading it. What was really embarrassing – she sent me the book herself for me to review!